Years ago Charlie Weiss’s mother had a house with an ADU, which provided additional rental income, companionship, and security. Charlie eventually took over his mother’s home and appreciated the advantages of having an ADU. The economics of a rentable space were appealing to Charlie and his partner Katharine, so when the couple built their own home they designed it to include an apartment. They’ve now included ADUs in two more homes they’ve built and they’re grateful that Portland’s policies now support the creation of ADUs. Charlie and Katharine explained that it was a difficult for them to separate the cost of their ADU from their total construction budget because they built multiple units at once. Additionally, because they built the ADUs over the garages at The Leapfrog House, it’s difficult to parse out just the cost of the apartments. Charlie notes that he and Katharine were inspired to build ADUs because it was “a good way to increase the density in this neighborhood.” By constructing two houses, each with its own ADU, they were able to increase the number of living units on the lot from 1 to 4 without changing the character of the neighborhood. Katharine explains that driving factors for them during the design process were efficient use of space, materials and energy. Their litmus test was whether they were creating spaces they would want to live in themselves. They wanted to build their home and ADU so that they could “age in place,” living in either the main house or the ADU. Rental income was a key factor in their decision to create their first ADU and it’s continued to be important for the next two ADUs, but Katharine and Charlie explain that community-building has become just as compelling. Katharine explains that they screen their tenants and they’ve always been great renters. Over the years their tenants have included a young mom and her 4-year-old daughter and a single woman law student whose boyfriend eventually moved in, too. 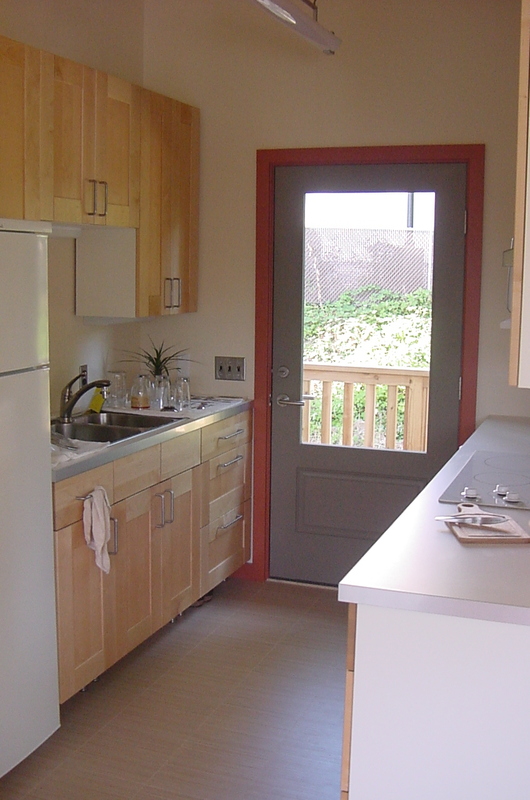 One tenant in her twenties lived with them for several years in their previous ADU, and moved with Charlie and Katharine into their new house with an ADU. This former tenant’s father is the current tenant. One of their tenants with chemical sensitivities said that she had never felt better than when she lived in Katharine and Charlie’s ADU. And no wonder. 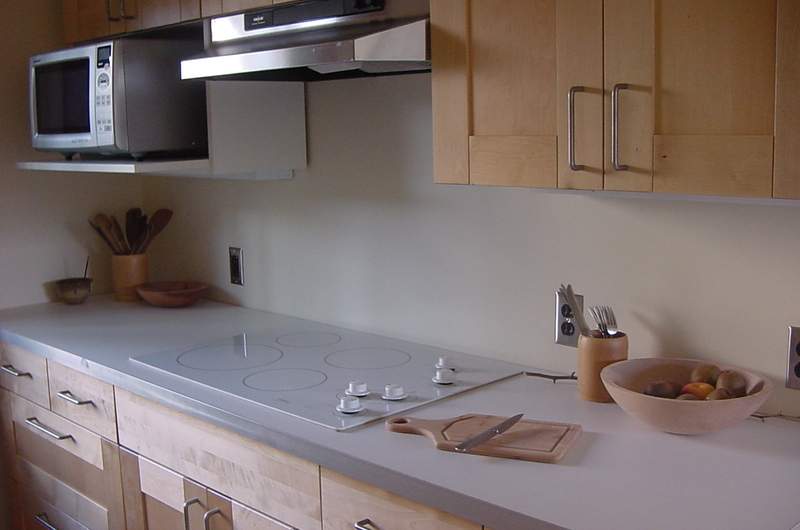 Katharine and Charlie’s project was built to LEED platinum standards. 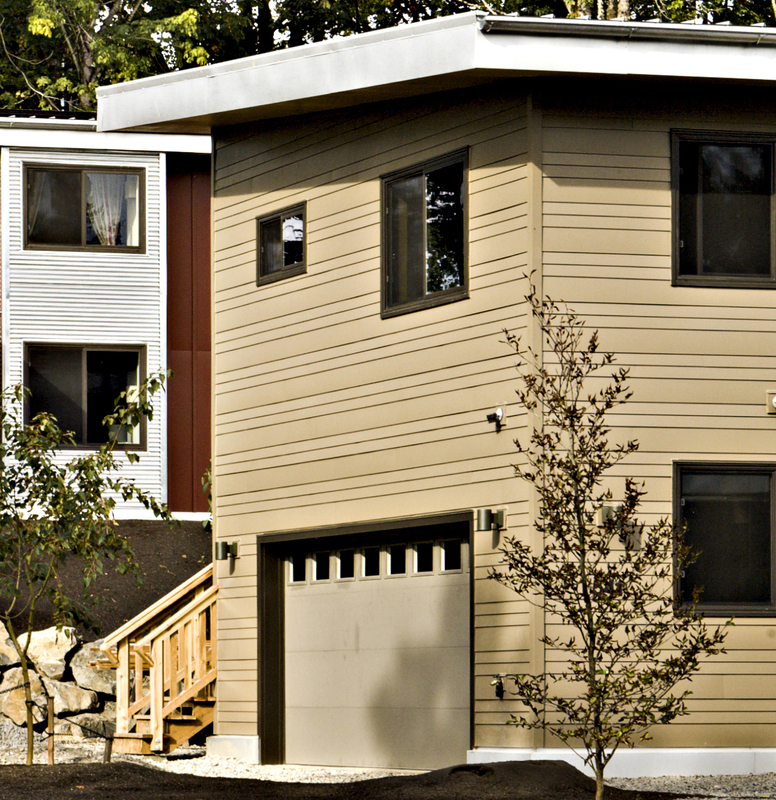 The ADU features cork floors, all local lumber, energy-efficient appliances, and both hot water and the space are heated by a ground-source heat pump that delivers heat through radiant panels. 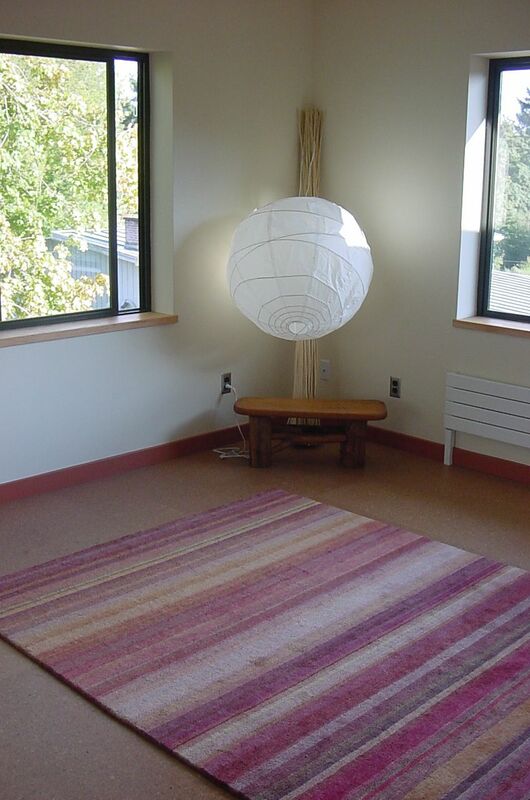 (The couple notes that there’s a challenge placing furniture in front of radiant panels, but otherwise they’re pleased with the system.) 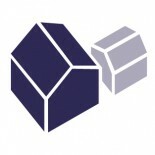 The ADU’s envelope includes R-30 walls and R-60 roof. With big windows on three sides, the ADU also has good natural daylight and views. Thirty solar panels on the roof provide about 40% of the annual energy. The homes also have a rainwater harvesting system with two 3000 gallon cisterns, which provides all water – including drinking water – for most of the year. In addition to fitting in a long list of sustainable features, the attached houses also maximize storage. When asked about the challenges they faced in building their ADU, Katharine joked that the hardest part was putting the IKEA cabinetry together. Then she explained that financing the project was the biggest challenge. When they began the project the housing market was hot and building LEED platinum houses on spec seemed like a good idea. By the time they were ready to sell their spec house, the housing market had plummeted. Although Katharine and Charlie assured me no children were actually sold in the making of their ADU, the cost of financing the property for several years certainly put a damper on their spending. Additionally, the waiver of System Development Charges (SDCs) had not yet gone into effect for ADUs. 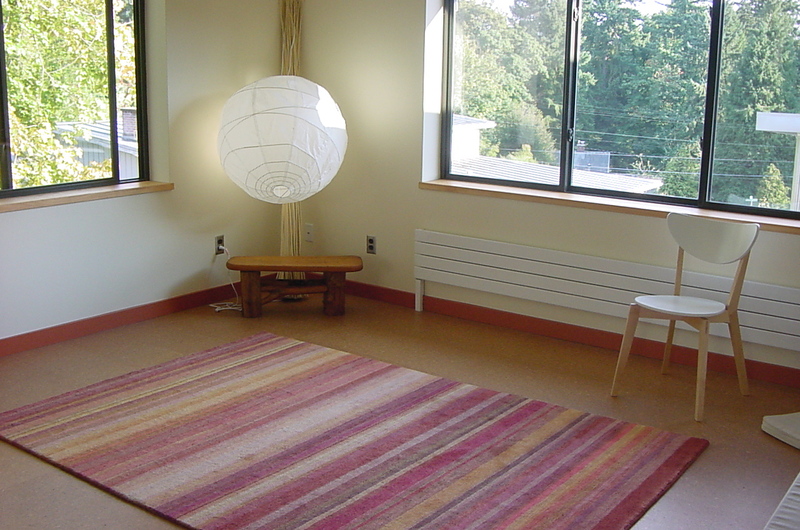 Although the ADU is currently rented as a long-term rental, Charlie and Katharine appreciate that their ADU offers them flexible space. The ADU could be used as a studio space for their daughter who is an artist. It could be used for an elderly parent. It could also be workspace. They figure the ADU space could comfortably accommodate 2-4 adults working, which would be more affordable than a space downtown – and certainly a shorter commute. So what advice does Katharine have for homeowners considering creating an ADU on their own property? Nice post. It’s interesting that they would caution, “If it’s strictly for the money I suppose you can make it pencil out”. If they’re renting it out at $1K a month with very little vacancy, and it cost them up to $40K to build, their break even date was only ~3 years. Indeed—it definitely penciled out for them! Sounds like they were very ambitious in terms of environment. The rainwater harvesting, including cisterns, is a very unusual feature. 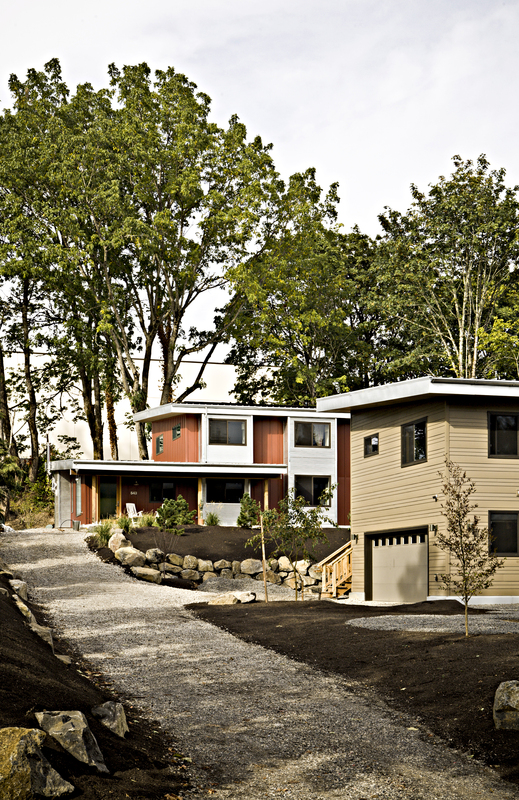 Are the homeowners saying that the ADU helped them pay for this kind of super-greenness? 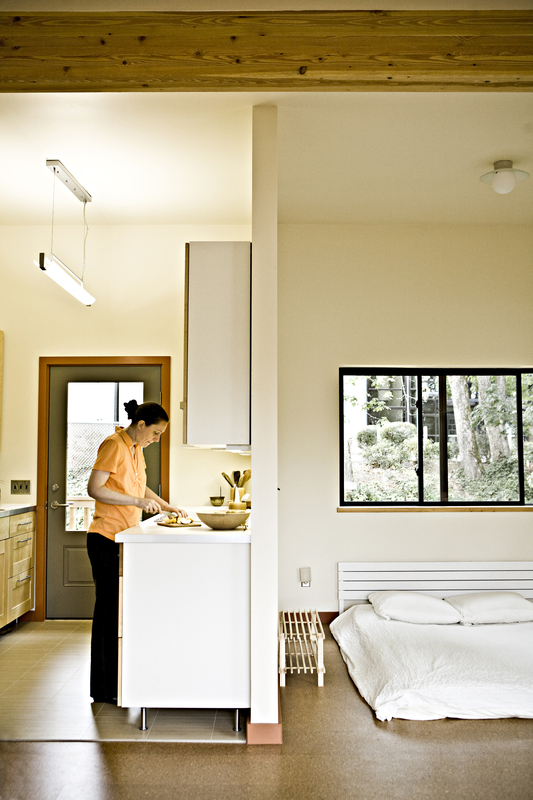 This entry was posted on August 1, 2014 by linamenard in 400-599 SF, Case Study, Floor Plan, Internal, New Construction and tagged Charlie Weiss, green ADU, Green Hammer, Katharine Lawrence, Kathy Kramer, Leapfrog House, sustainable ADU.